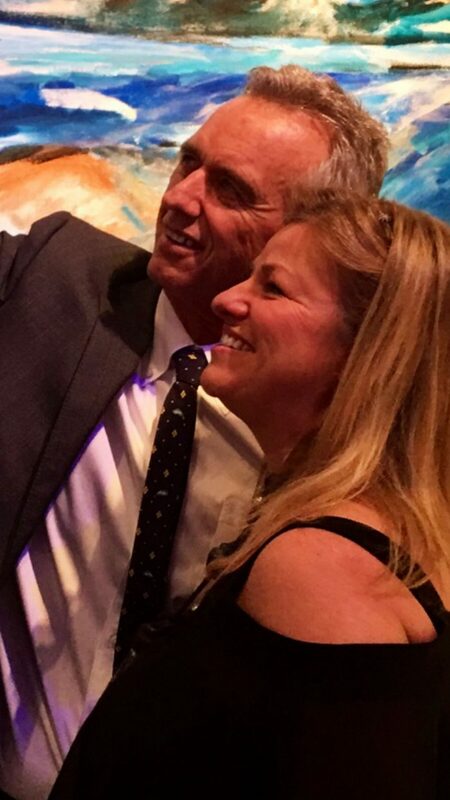 Park City-based painter Josee Nadeau stands with Robert Kennedy, Jr.,during the Waterkeepr Alliance's Art for Water auction att Sotheby's in New York. Nadeau's painting, "Breath of Fresh Air," which is installed in the entryway of the Waterkeeper Alliance's headquarters, is in the background. Visual artist Josée Nadeau is on a roll. The painter, who spends part of her year in Park City and the other part in Florida, spent the first weekend in February at Music-Con 2018 in Salt Lake City. There, amongst vendors world-renowned musicians such as bassist Jeff “Skunk” Baxter, Anita Cochran and Train co-founder and former bassist Charlie Colin, Nadeau painted. One of the works she did was a portrait of a young George Harrison. Nadeau got involved with Music Con thanks to Colin, whom she met during the Sundance Film Festival last year. A few months later, the head of Music-Con, Gary Robinson, met Nadeau in Park City and told her about Music-Con and asked if she could paint Colin. “I did and it was interesting because I did it when they were in an interview,” she said. While painting musicians isn’t something new to Nadeau — she also painted Dionne Warwick a few years ago during the singer’s 50th anniversary celebration — the painting of Colin was different because she captured him while being interviewed. Baxter asked Nadeau about the painting. Other portraits Nadeau has painted in her life include Nelson Mandela, which she did for the 2014 Footsteps of Mandela during the Nelson Mandela Tribute in New York City in front of United Nation and the South African delegates. She also has painted her good friend, actor and art collector Pierce Brosnan, as well as the Queen of England and Olympic gold medalists Joss Christensen — who was her son’s roommate — Sage Kotsenburg and the late Stein Eriksen. This 8-foot tribute of Eriksen, which was purchased by the Stein Eriksen Lodge, hangs in the main lobby of the hotel. Painting large works is an honor fo Nadeau, especially if she is doing them for friends, such as Robert F. Kennedy, Jr., the founder of the Waterkeeper Alliance, a nonprofit that, as its mission statement says, “fights for every community’s right to drinkable, fishable and swimmable water. Her painting, titled “Breath of Fresh Air,” which measures 6 by nearly 7 feet, has been installed in the entryway of the Waterkeeper Alliance headquarters on Wall Street. Nadeau’s relationship with the Waterkeeper Alliance stems from her participation in the nonprofit’s Celebrity Ski Fest fundraiser that was held every December for 25 years at Deer Valley. The painter has painted during the fundraiser’s gala dinner for several years and donated her work. “I was suprised that it didn’t happen this year,” Nadeau said. Still, Nadeau was one of the artists that were invited to contribute art to the Waterkeeper Alliance’s Art for Water auction in Sotheby’s in New York. The event was chaired by internationally renowned artist Jeff Koons, who co-chairs the event with fellow artist Ed Ruscha. “It was very uplifting and rewarding to be part of that,” Nadeau said. In keeping with her relationship with Kennedy, Nadeau was able to create a relationship with his uncle, President John F. Kennedy, through her art. Nadeau’s paintings will go on display during that time, and the museum will invite Kennedy’s sister-in-law Ethel to a private reception. Nadeau, the protégé of European art expert and curator of Chateau Versailles Gerald Van der Kemp, also known as the man who saved the Mona Lisa from the Nazis during World War II, was also a personal guest of his wife, Florence, at the Grand Masked Ball of Versailles. While the painter is proud of the big moments, she also enjoys the little ones, which include having her paintings on the cover of the Park City phone book for the past four years. “It’s great to know that homes Park City will have an image of my works,” she said. This year’s painting on the book is of horses, which is one of Nadeau’s trademarks. She has created works for the World Equestrian Festival in Wellington, Florida, and also painted during the Miami World Cup Polo and for Ralph Lauren. A few years ago, she painted at a fundraiser for the TAG Ranch in Coalville. While Nadeau’s art has taken her all around the world, she takes things in stride. For information about artist Josée Nadeau, visit joseenadeau.com.